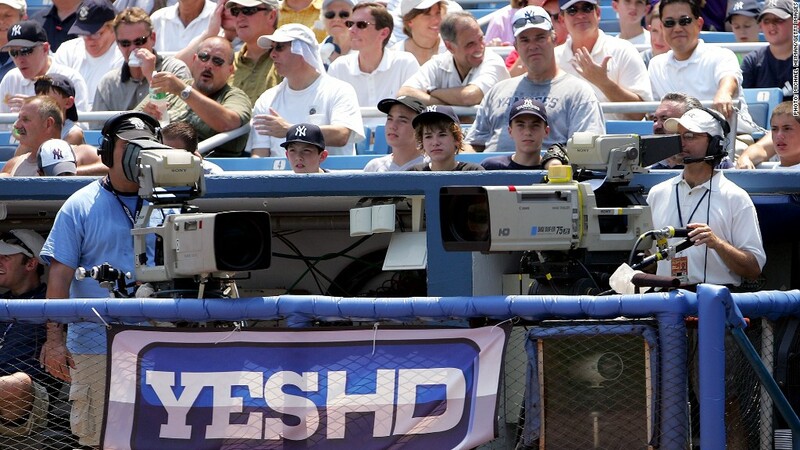 Rupert Murdoch's News Corp purchased a 49% stake in the Yankees' YES Network. Rupert Murdoch's News Corp acquired a 49% stake in the YES Network, which features live television coverage of the New York Yankees and the Brooklyn Nets. The YES Network's current owners, which include Yankee Global Enterprises, Goldman Sachs (GS) and others investors, will reduce their stake. As part of the deal, News Corp (NWSA) has the option to increase its ownership to 80% in 2015. The terms of the acquisition were not disclosed, but a source close to the deal said it valued the YES Network at $3 billion. "Partnering upstream with rights holders is even more important today in the dynamic media marketplace in which we compete," said James Murdoch, News Corp's deputy chief operating officer, in a statement. He said News Corp is "strategically re-entering the New York market" with this deal. The Yankees Entertainment and Sports Network, which reaches 9 million households in the New York area, also announced that it had secured a media rights agreement that will keep Yankees baseball on its station through 2042. The agreement is subject to Major League Baseball approval. News Corp already owns a broadcast sports division, the Fox Sports Media Group, which operates 20 regional sports networks in the United States. In June, News Corp. announced plans to split into two publicly traded companies: An entertainment division and a newspaper company. The YES Network will be housed in the entertainment division, which also operates cable stations Fox News and FX and film studio 20th Century Fox. The newspaper division includes the Wall Street Journal, the New York Post and the Times of London. New Corp has been under pressure after it was revealed that the London-based media conglomerate's executives and reporters were involved in a phone-hacking scandal in the United Kingdom. Murdoch shuttered British tabloid News of the World, which was at the center of the scandal. On Tuesday, former News of the World editor Rebekah Brooks was charged with conspiracy over illegal payments to British officials in the scandal. Despite the company's legal troubles, the company's stock is up more than 35% this year.